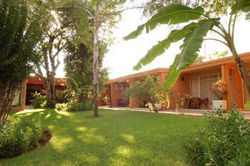 Ruacana hotels, accommodation and places to stay. 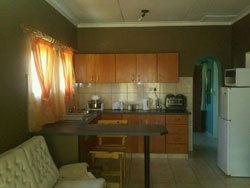 Guide to where to visit and where to stay in Ruacana Namibia. 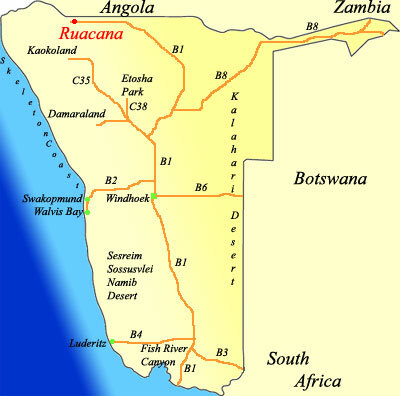 Information on Ruacana Namibia, location of hotels, lodges, camp sites, guest houses, bed and breakfasts and places to stay in the Ruacana area of Namibia. 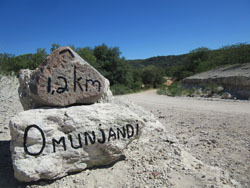 Distances from major attractions to Ruacana and information about shops, fuel and facilities. Ruacana Lodge in northern Namibia is a natural gateway to the wonders of the Kaokoveld, the Etosha National Park, the Epupa falls and the vibrant African culture of the Omusati, Oshana, Ohangwena and Oshikoto regions. 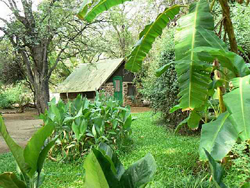 This glittering oasis in the rugged landscapes, offers relaxation, conferencing and opportunity to come face-to-face with forgotten Africa. 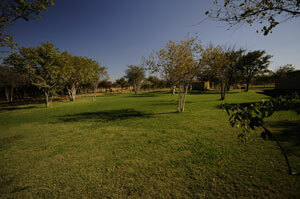 On the banks of the Kunene River, only a short walk upstream from the spectacular Epupa Falls lies the Omarunga Camp. Hidden in the shade of the exotic Makalani palm trees, this little paradise is definitely one of Namibia’s most secluded getaways. We invite you to visit Serra Cafema Camp, one of the most remote camps in all of southern Africa and offering one of the most memorable experiences in Namibia. An exclusive desert getaway on the banks of the Kunene River in the remote north western section of Kaokoland overlooking Angola. 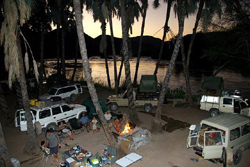 Omunjandi Restcamp is located right next to the Kunene River, in the upper North-Western part of Namibia, Africa.